With advanced USB-C connectivity, the Cygnett ChargeUp Pro 10000 mAh 18W USB-C Power Bank is the ultimate companion to power your digital life. 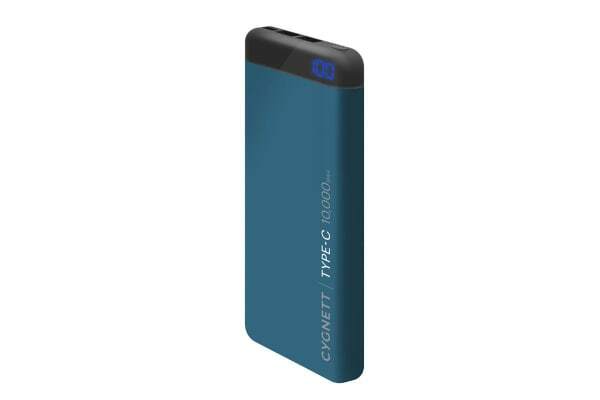 Featuring the latest in Lithium Polymer battery technology, the Cygnett ChargeUp Pro 10000 mAh 18W USB-C Power Bank provides you with power at your fingertips for when you need it the most. With a USB-C focus, the ChargeUp Pro 10K supports the emerging standard for charging and supporting digital devices. Strong and portable along with its soft touch finish means that the ChargeUp Pro 10K is ultra-convenient making it the perfect addition to every backpack, briefcase or suitcase. The ChargeUp Pro 10K features 18W USB-A output with Qualcomm (QC 3.0) technology allowing a 75% faster charge on the latest of devices, so you can power up quickly and effectively while you’re on the go. With its total of 18W output, this power bank allows you to charge various items such as your smartphone, tablets and other similar sized devices. You are also able to charge two items simultaneously using the the dual USB ports.